If you or your company already has a website, up-and-running, that’s great! You may also be in the position where you understand the importance of content creation and have decided that having a blog or creating audio or video content is a going to help you to generate more traffic and that ultimately this will help to develop more leads and close more sales. If you’re not sure, read “Why Your Company Website Needs a Blog Section”. Unfortunately, many people then run into the reality of running a blog or generating high-quality articles, or audio or video content, on a regular basis. Posts can become sporadic, and even dry up altogether. And this can actually harm your website, because when visitors arrive they might see a really old date alongside the latest blogpost, and start to question whether the site is still active. Does the company still exist? This can lead to higher bounce rates and lower levels of interaction. So, there comes a point in the development of many blog and corporate sites where the understanding is there, and the intentions are right, but the reality is different. Why is this? Well, it’s often due to the fact that the person responsible for the blog runs out of time (they may have many other responsibilities within the company) or ideas (this can often happen in specialist niches where it sometimes appears, at first sight, that there are no other relevant topics). In order to get started, you should think about what type of content you would like to release. There are many different content types available but generally they fit into the categories of written, audio or video. There are other categories of course, such as Instagram posts, which is more image-based and so perhaps they don’t fit into one of the aforementioned categories. But for many starting out in content creation, the categorization is useful. It is often a good idea to start out with written content. The reason for this is that producing written content is relatively easy (it is usually easier to produce than audio or video content), it is easy to publish and has very clear SEO benefits. If the written content that you produce is relevant and high-quality, then over time others will find it, read it, share it and link to it, all of which will serve to enhance your Search Engine Ranking Position on Google. Of course, that is not the case for everyone. 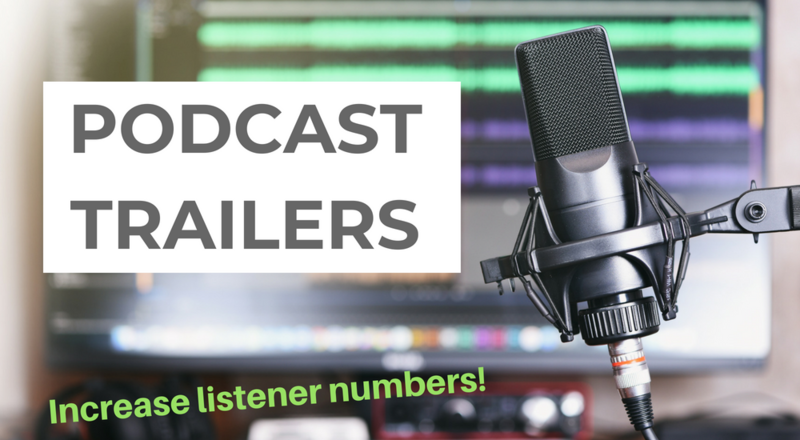 Some people prefer to produce audio (such as a podcast), for example, and then generate “SEO juice” by producing a transcript to accompany the audio. But, generally speaking, written content is a good place to start. If you decide on this course of action then it is also important to consider how often you would like to post, and how long those posts are going to be. Regular posting not only gets you into a good habit, it is also well regarded by search engines, and so by posting great content on a regular basis, you are probably going to get more exposure for your business. There has also been a lot written about whether it is best to post short-form (say 500 words) or long-form (say 2,500 words) content. I think there are certain merits in producing different lengths of content, and I know some content writers also adopt the approach that a piece of content should be “as long as it needs to be”. Whatever you decide, it helps to have a target number of words to aim for. The other component is frequency. How often are you going to release content? There are some bloggers who release a new post every single day, and there are others who post extremely detailed posts on an infrequent basis. There is no right answer, but I think that for many companies starting out, a weekly schedule makes sense. Releasing content weekly enables companies to release a good amount of content, and creates plenty of opportunities for sharing. As an example, for one of our clients, we produce one 1,000 word blog article every week. It’s easy to make sure we are on track, and we are able to plan out the content in advance. There are times when writing or producing audio or video content is not the most difficult part of the process. Instead, it’s coming up with great content ideas on a regular basis. This is due to the fact that, when you are producing content for a particular niche, it’s usually easy to come up with 20, or even 50, good ideas, but after that it’s natural that your idea generation is going to taper off. Furthermore, it’s not a great idea to simply repeat content with a slightly different title as this might simply have the effect of diluting your own content. 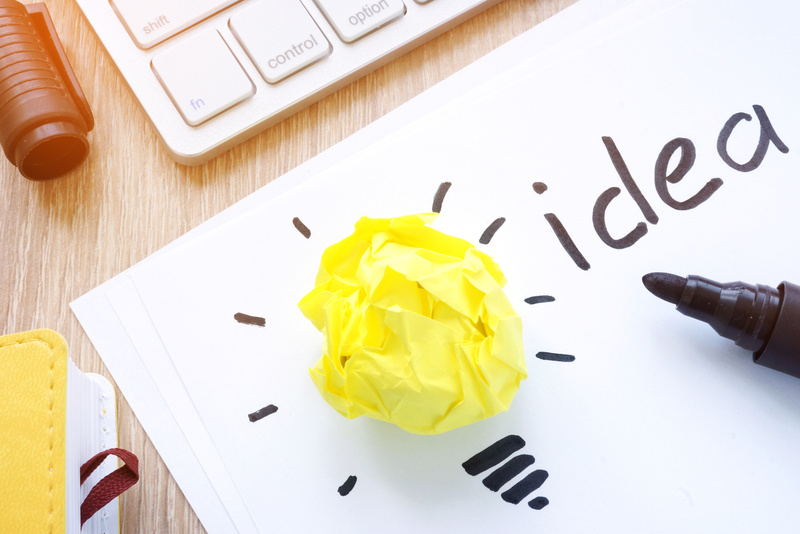 There are quite a few online tools available that will help you to generate content ideas. Normally they work by asking you for a list of keywords or ideas, and by asking you a few questions. Based on what you enter, the program will then give you a list of content or blogpost ideas. While these services can come up with titles that definitely don’t work, they can also come up with some great ideas. The titles might need adapting or refining a bit, but it’s a great way to get a bunch of ideas in a short period of time. While some people may be more creative than others, I’m a firm believer that anyone can develop and improve their creative skills and that the main way of doing this is by practicing, or by actually being creative. In other words, the more you write and jot things down and work on ideas, the more this will start to come naturally. And when those ideas do pop into your head, it can often be at the most inconvenient moment. You might be out jogging or driving to pick up your kids from school. That’s why it makes sense to have your smartphone handy, and note down your ideas as soon as you can. Once it’s down in your smartphone, it can easily be transferred to excel where you can work on developing the idea more comprehensively. So, while not all of your posts need to follow this format, it would seem to make sense for at least some of them to. Besides, writing this type of post sometimes makes it easier to come up with a great title, and in the case of list posts, you already have an easy structure to follow when writing. I don’t spend huge amounts of time analyzing the competition and their websites, because my business philosophy is based more around the success that one can achieve by focusing on one’s own goals. However, there are times when it is is good idea to see what your competition is up to, and checking out their content creation program is one such time. By investigating the competition, you can not only see if they have a content creation program and how often they are updating their content (are they posting every week? When was the last time they posted? Are they producing video and audio? ), but you can also get some ideas for your own content. Of course, you should not directly copy something that you see on a competitor’s website, but you might get some good ideas for topics to write about, and then you can come up with your own unique spin on a particular subject. I am a big fan of evergreen content – content that is going to be relevant at all times and that is probably going to continue to be relevant for years to come. 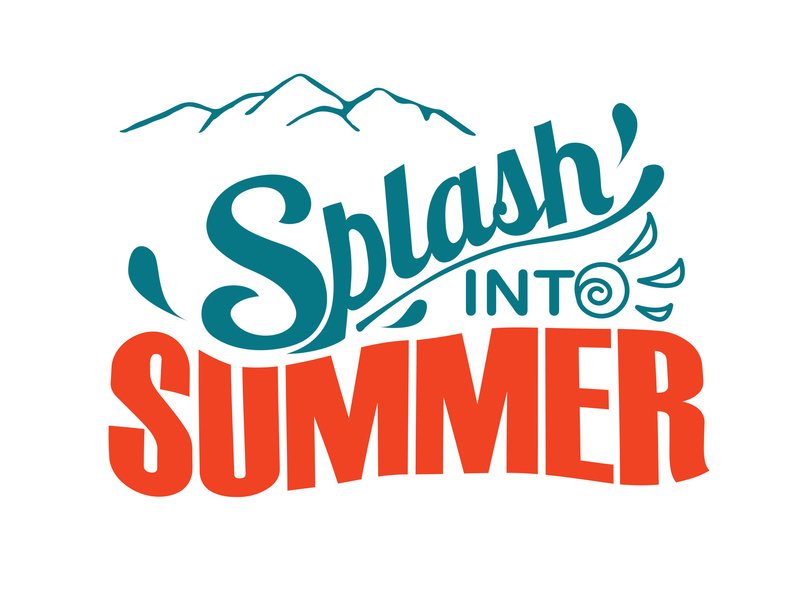 But there is also a case for producing seasonal content – content that relates to a particular event or time of year such as the start of summer, or Thanksgiving. While interest for topics based on these seasonal ideas is likely going to peak at the relevant time of the year, and drop off significantly afterwards, it can still be a useful strategy for a number of reasons. First of all, it is possible to get very high traffic during the period in question, and that can make up for lower traffic during the rest of the year. Also, even though the content may not be evergreen in the sense of being relevant at all times, it can still be relevant for many years to come at the right time of the year. Finally, seasonal content can be a bit more engaging and interesting as visitors really appreciate the relevance of the content. So, don’t discard seasonal content – it can work well as part of your overall strategy. Interviewing people is a fantastic way to create content. It enables you to show another perspective and to share information and knowledge that you might not have with your audience. When done right, interviews also give content that authentic viewpoint – readers, listeners and viewers feel they are part of the conversation and that can make this kind of content very powerful. There are several ways of going about this. 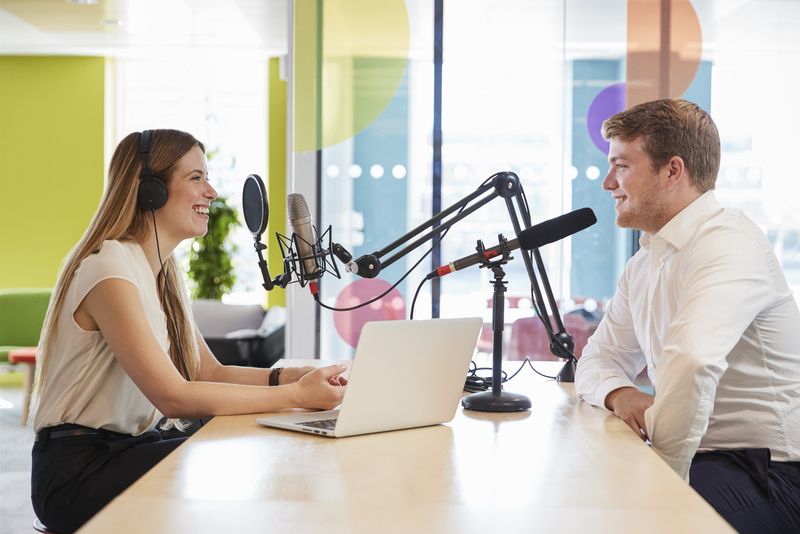 You can record a podcast or audio interview with someone within your organization (or, even better, with a number of different people) and then share this audio clip or podcast as part of a blogpost. You can also include the full transcript of the interview in order to get maximum SEO value. Alternatively, you can write out a list of questions and ask the interviewee to fill in their answers – a type of questionnaire essentially, which you can then edit and publish. If you can include a high-quality photo of your guest, even better. I also find that while most of the time in such an interview should be dedicated to talking about the main theme in question (which could be marketing, engineering, new products, their experience in the company, or something else), it’s also a good idea to include a couple of more personal questions, or encourage the interviewee to share something about themselves which is not specifically work-related. This helps the audience to identify more easily with the interviewee and can contribute to the overall success of this type of content. If you are a little stuck for new content ideas (and this happens to all of us, at one time or another), then one thing I can suggest is to start talking to other people and ask them for their ideas. It’s amazing what a fresh perspective can give you. You might even talk to people who don’t fully understand your niche, they can still give you fantastic ideas for pieces of content. Just start talking, and asking and you might be surprised how helpful others can be! 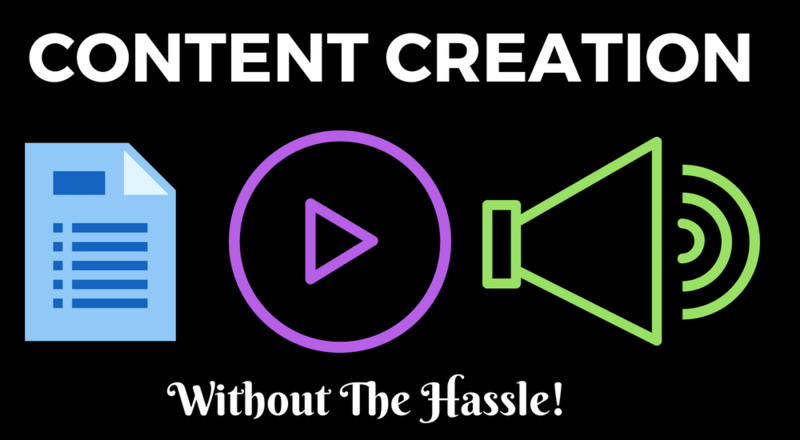 Creating content takes time and costs money (like so many other things in life!) and that’s fine, but it is important that you get the most out of your time and monetary investment. One way of maximizing the effect of your efforts is to repurpose content where appropriate. You can use the same idea or the same piece of content in different ways or different settings – you don’t need to produce every single piece of content from scratch. Another good reason for repurposing content (as well as saving you time) is that it allows you to reach a larger audience. The reason for this is that some people prefer to read, others only watch videos, and others still like to listen to audio. While it is true that some people consume multiple types of content, producing content with similar themes but in different formats will definitely help you to spread your message further. Now that you have lots of ideas, it’s time to refine them and decide which ones are actually going to make it to the website. You should consider a number of different factors when making your decision, taking into account the content you already have on your site, and the direction you wish to go in. It’s best to avoid content that is too similar, so if you already have a blogpost entitled “10 Ways to Get More Instagram Followers”, then it probably doesn’t make sense to produce another one called “7 Ways to Increase Your Instagram Following”. If you do have some genuinely new ideas that you want to share, then I think you would probably be much better off going back to your original post and improving it. In fact, there are often times when it makes sense to go back and improve a previous blog post: add a new section, update links, and generally refresh a piece so that it can have a greater impact. But for now, let’s focus on the new content. As well as making sure you are not simply repeating yourself, it’s probably a good idea to look at the overall balance of your topics in accordance with your goals. For example, if your company has 3 main business lines of equal importance, then it would seem logical that your content should also feature these same 3 business lines, with roughly the same amount of coverage for each. Once you have a clear list of titles and content types, it’s time to move on to the next step: creating a content calendar. Now that you have some great ideas, a really key part of the process is to map out when this content will be released. This is going to help you plan your content in advance, and make sure you have a timetable to stick to. The fact is, if you don’t have a schedule set up then the content that you are releasing will probably slow down and then stop altogether at some point. Having a content calendar will help to keep you on track. The other thing to remember is that the benefits of content marketing are usually much more apparent in the medium term. While I don’t know exactly how the Google and YouTube search engines work, they appear to give credit to websites that post on a regular basis, and to channels (in the case of YouTube) which release videos in accordance with a regular schedule. So if part of the “secret” is producing great content, then the other part is probably releasing that content on a regular basis. Creating a content calendar doesn’t need to be difficult at all. In fact, once you have a list of your upcoming pieces of content, ideally divided into sections (audio, video and written, say), then you can start to decide what on which days you are going to release each piece of content. For example, for one of my projects, I release a podcast on Tuesdays, a blogpost on Wednesdays and a YouTube video on Thursdays. This enables me to plan content well into the future, and it makes it easy to ensure everything is going according to plan. OK, so I accept that this is not the most sophisticated tool you are going to come across, but for many people starting out in content creation, it does the job. 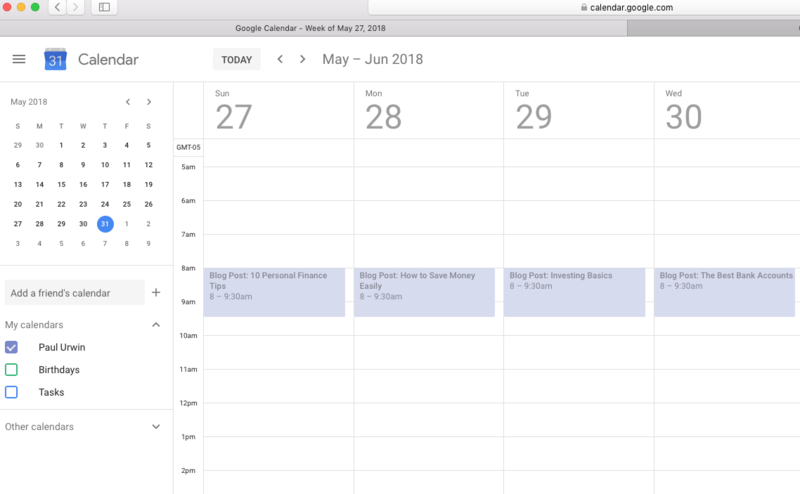 For something a bit more advanced, you can use a calendar tool, such as Google Calendar. What I particularly like about using Google Calendar, is that you can set up recurring events. For example, you can set it up so that a blogpost appears every Thursday. Then, you can go in and edit each entry to reflect the title of the blogpost that you will be releasing that particular week. Then, you can press “save”, making sure to click the option “This event”. This will save the changes on that event, leaving all of the other events in the series unchanged. This is a great feature because it means you can keep the title which reflects the content type, and then change the title of each event without affecting the recurring nature of the event. Moving one step further, there are “premium editorial calendars” available such as Coschedule which make it easy to view multiple schedules, communicate on a platform and also to schedule social media posts. This paid option is probably a great solution for those who already have a certain amount of volume, work as part of a team and/or are managing multiple websites. But for those getting started, the most important part is getting started and getting into the rhythm of producing and releasing content on a regular basis. For that purpose, using a handwritten calendar or an online calendar such as Google calendar should be enough. One of the most common reasons for failing to release content on a regular basis is a lack of time. If you already have a full-time job, or if you are really busy with entrepreneurial projects, then taking on another task, especially one that is on-going, is not always easy. 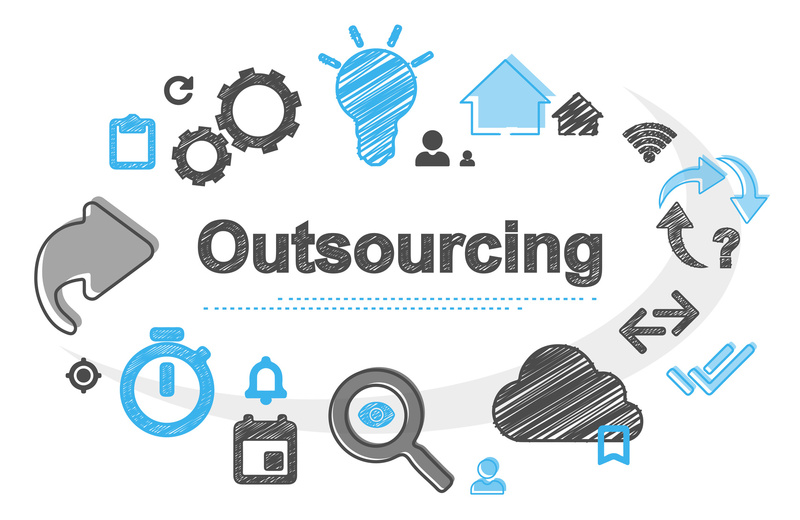 This is where outsourcing part or all of the process can help. Outsourcing content creation can be a great way for a company to increase exposure while at the same time continuing to focus on their core business. Many parts of the content creation process can be outsourced, from coming up with catchy titles for blog posts, to writing short and long form articles, to selecting images and uploading everything to your company website, there are providers to who can help. 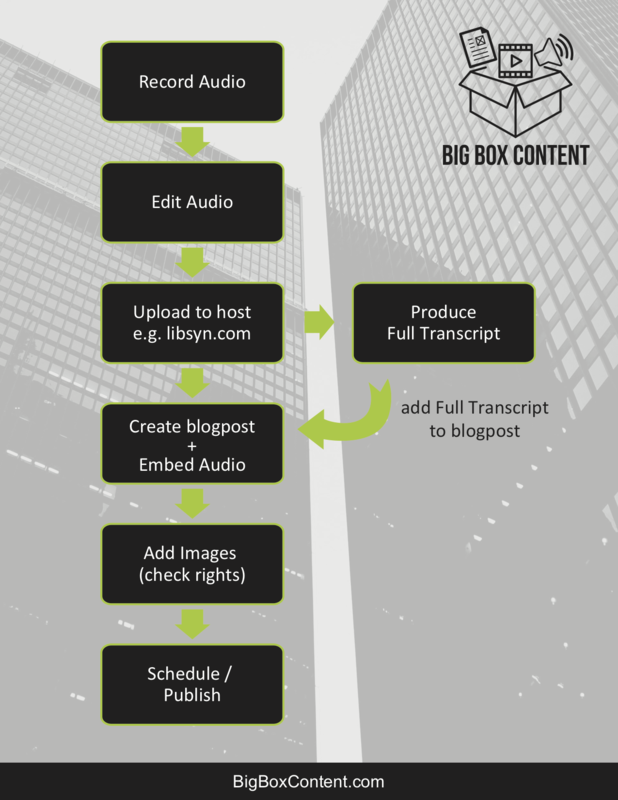 In fact, here at BigBoxContent.com, we work on content creation all of the time, helping many companies of different sizes. Of course, it is likely that some work will be required on your part. 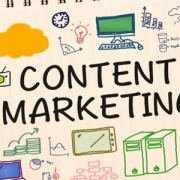 The reason for this is that when outsourcing content creation, it is important to work hand-in-hand with the content marketing company, to make sure they are producing the types of content your require. They will need to understand your market and goals, and the tone of message you wish you share. This understanding comes by working together – and don’t forget that you will know and understand your company’s products and services much better than a content creator – at least at the beginning of the relationship. Once you have decided the types of content you wish to release, and have come up with a content calendar, it’s time to start thinking about your content production workflow. Why do you need a workflow anyway? Well, technically, you don’t. For example, you can just start producing. You might hire someone to write a blogpost and then you might review it and upload it yourself to you site using WordPress. You might add some images yourself and then schedule the post to publish on the date you have planned out in your content calendar. That can work, but some content production proccesses are a little more complicated and it can help to have everything planned out in advance. For example, in the case of audio content creation, the workflow might look something like this. I find this kind of workflow very helpful, it allows me to understand what it going on at each part of the process. It also makes it very easy for me to bring in extra help to work on the content creation process, as I can explain to someone exactly which part of the process they should be working on, and I can clearly see how that fits in with the overall objective. 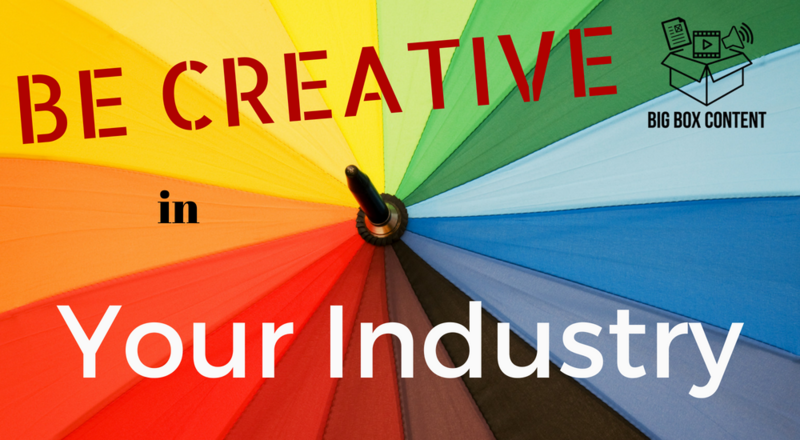 Whether you are outsourcing the content creation, or producing it yourself, it makes sense to produce it in batches. It’s just so much more efficient. For example, when writing shorter blog posts, it is more efficient to set aside some time and write 2 or 3 blogposts in the same session. When producing audio podcasts, it takes some time to set up the microphone, make sure the levels are correct, and that the level of background noise is acceptable. Once you have this all set up, it makes sense to record 2 or 3 audios in the same session. The same goes for creating transcripts, and many other examples of content creation. Producing content in batches will help you to be more efficient and produce more content in a shorter time. Finally, make sure you you get ahead, and stay ahead in terms of producing content. There’s nothing worse than having to wake up, produce a podcast, edit it and release it all within a couple of hours of waking up on deadline day. I know, I’ve been there! It can also affect the quality of content you are producing – producing great content takes time and dedication and it is not ideal to be producing content at the last minute. So, when you have a content calendar, complete with a list of topics, I suggest you start creating, and produce more content than you need to cover the next couple of weeks. Ideally, I like to be one or two months ahead. Sometimes it’s difficult to get started, and I wouldn’t expect you to be one or two months ahead straight away, but once you get into the routine, it is achievable and it certainly makes things easier – there is no stress to produce content at the last minute. Producing large volumes of high-quality content does not need to become a chore. With a bit of planning and management, it is possible to set up a smooth process that works for the months and even years ahead. Content marketing takes time to have an impact on your business, and therefore it’s important that you are in this for the medium term – once it starts to work, the results can be spectacular and help the profile or your business or organization to a completely new level! About the author: Paul Urwin is a Cofounder of Big Box Content, a content creation studio which produces audio, video and written content for clients, helping them to increase brand awareness and make more sales.